Escape from the humdrum boardroom for your next executive retreat. At these unique spaces in Lehigh Valley, your group is sure to have a productive session. 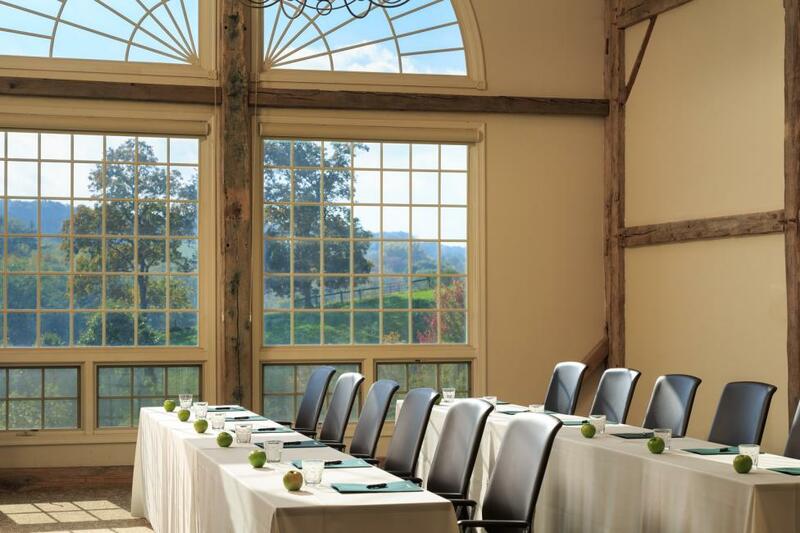 A retreat to Glasbern, located in Fogelsville, is sure to leave your executive team’s head swirling with new ideas. This property is set amidst 150 acres of countryside, yet it’s just minutes from main thruways and Lehigh Valley International Airport. One of the main highlights is the working organic farm that provides many of the culinary delights that are served at this Historic Hotel of America award-winning location. Glasbern offers a 3- and 5-Day Executive Retreat Package (https://www.glasbern.com/packages.html) for groups of 12 or more with overnight accommodations that offer fireplaces and whirlpools. Daily made-to-order breakfast, lunch, beverages, dinner, and wine and beer are included. Prices vary depending on the season. Looking for team bonding activities? Have your group prepare a gourmet meal or a one-of-a-kind ice sculpture with the chef! You can also try the Pond & Pasture Whole BrainⓇ Team Solutions program to explore innovative thinking, cognitive diversity, and thinking agility. Looking for a place to tee it up with your team? Woodstone Country Club & Lodge in Danielsville, Pa. offers a championship 18-hole golf course located right outside the doors of the meeting and event space and their unique guest accommodations. Overnight guests of The Lodge receive complimentary continental breakfast and can add six, nine, or 18 holes of golf for the perfect team building environment. This pristine golf course with stunning views, offers five sets of tees for any level golfer. The Lodge at Woodstone offers four suites and 15 standard rooms each with their own unique flair. The lobby is absolutely breathtaking with a dual staircase and fireplace which can also be used as a breakout space for your team’s meeting. The Country Club has a 6,300 sq. foot Grand Ballroom with a two tier patio that is large enough to accommodate 300 people, while the Private Executive Boardroom is great for much smaller gatherings. There are also a few other rooms that can host as many as 60 people. Be sure to finish the day at the 19th Grille at Woodstone. Here, you’ll find a full bar and a more casual menu. Consider booking your meeting on a Tuesday so you can finish the day with Tap & Apps Tuesday where your group will enjoy $1 drafts and half price appetizers! Don’t have any golfers on your team? You’re in luck, as Woodstone is located less than five miles from Blue Mountain Resort. This year-round resort offers skiing, mountain biking, a ropes course, disc golf, and so much more for the perfect atmosphere to bond as a team. To book your next retreat, contact Suzanne today.